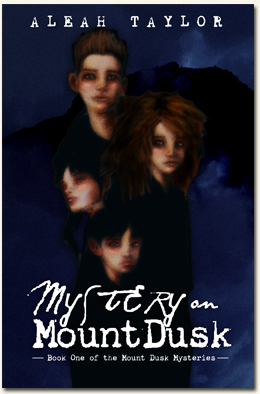 Ten year old George Mutton has moved to the mysterious town of Mount Dusk. Tucked away on a secluded mountain, Mount Dusk is the perfect place for restless George to discover adventure, but he might get more than he bargained for. George befriends dark-haired loner Charlie Redwin and together they uncover the startling mystery of two missing families who vanished hundreds of years ago. At first a seeming pest, George's little sister Maggie eventually becomes an invaluable ally while Charlie's twin sister Yvonne remains a mysterious presence. She appears to know the secrets of Mount Dusk, but is she at all what she seems? Can she be trusted to help them? The children endeavor to find the answers to all their questions, but they end up more personally involved in the mystery than they had ever imagined. With disappearances, ghastly ghosts and trapped spirits, the children become suddenly entangled in the hidden evil of their town which has lain unseen for many centuries. Can they rid Mount Dusk of the horror haunting it? Or will they become just another chapter in its terrible secret history?